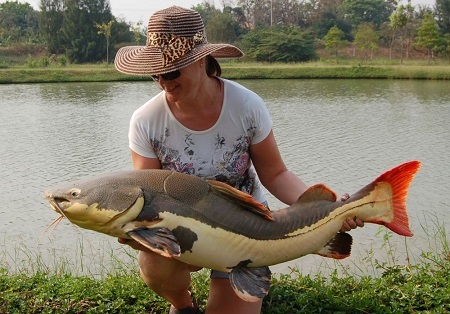 Rami and Saija from Finland continued their Thailand fishing holiday predator fishing at IT Lake Monsters. The anglers began lure fishing with bait casting reels which they expertly cast into the predator lake. It was not long before both anglers were hooked up with predators with both anglers landing a selection of Alligator Gar and Asian Redtail Catfish in the early part of the day. Further casts with their fishing lures produced a few more bonus Pacu to 10kg’s. After changing over to deadabit in the afternoon the Finnish anglers were soon attached into several much larger predators in the form of a series of Redtail Catfish ranging between 12-20kg’s which continually homed in on their dead baits fished in quiet marginal areas. At the end of their days Thailand predator fishing trip the anglers had each succeeded in landing double figure hauls including a variety of predators which were both topped by good sized Redtail Catfish to 20kg’s caught on both lure fishing and dead bait fishing tactics. 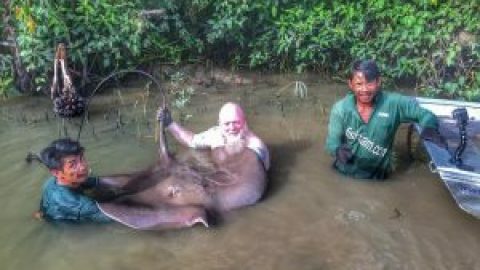 At the end of their days predator fishing at IT Lake Monsters the anglers returned back to Bangkok to resume their Thailand holiday with a visit to Phuket.